When I started journaling back in the early ‘80s, I looked forward to purchasing at least one new notebook every year and filling it up with journal entries. But after I started using the Day One journaling, my journal writing increased and I got even more out of the experience. I still love and admire beautiful paper journaling notebooks, and understand the reasons why many people prefer handwriting over the digital format . But a while back, I compared my written journals with my digital entries, and I honestly did not find a difference in my writing, except that I write a lot more in my digital journal, and I revisit my digital journals more than the paper notebooks boxed up in the closet. I started regularly using Day One back in early 2012 after my mom passed away. At the time, I was writing for an online magazine, so I spent most everyday typing, thus using digital notebook became more accessible and convenient than using a paper notebook. Day One is available not only my Mac, but also on my iPhone and iPad. Unlike my early days of journaling, I would not always have my paper notebook available to me everywhere I went. With Day One, anytime I’m inspired or need to write, my journal is fully accessible. I love to use Day One so much so that back in 2015 I published an ebook about the much earlier version of the application. Since then, many new features have been added to both the Mac and iOS versions of the application to enhance the various needs of journal writers. Each new journal entry automatically gets dated and timed stamped. I can both type and voice dictate my journal entries. I can easily edit, format, and revise my journal entries. My typed entries are clearly legible. My handwritten entries are painful to read because handwriting though not messy is not attractive. Day One now allows for multiple journals which means I can better manage and focus my journal entries. Note: you can also tag journal entries for management and filtering purposes. I like the ability to add photos and screenshots to my entries. Day One automatically records the location of where I write entries. This is great for when I’m traveling. Though I never have to worry about my family members reading my journals, it’s still great that Day One encrypts journal entries and the app can be password locked. The power of journal writing is the ability to write honestly about your thoughts, feelings, and experiences, and the best way to do that is to make sure that your journals are secure from the curious eyes of others. There are times I write journal entries that are very personal to me, so much so that I don’t ever want them read by anyone else. I tag those entries “personal” so that they will never be shared. In the future I might even start deleting those tagged entries. But in the meantime, my entries are kept secure on all my devices. The ‘On This Day’ feature in Day One is basically a walk down memory lane. Though it’s easy to browse and read from my over 2500 journal entries, Day One provides a daily listing of all past journal entries written on the current day. Today as I write this article, my Day One presents eight journal entries written on the same date stretching back five years. Rereading entries can be pleasant and memorable like viewing old photographs, but it can also be painful because you’re reminded of the bad days, and trials and tribulations you wrote about. Without the On This Day feature, I probably wouldn’t reread my journals as much, mainly because of my daily tasks and other distractions in my life. However, during the month of January, I do try to reread all my entries from the past year. I find that exercise to be a great learning experience and a way to reflect on my personal growth, and to set goals for the upcoming year. Every year I manually export my journal entries to a PDF file and archive them in my Dropbox account. But a few years ago, Day One added a feature and process for actually publishing journals or selected entries in paper book form. Though many of my journal entries not meant to be read by others, I have several hundred of them that I have published in book form, including entries I wrote while doing a self-study of jazz music, and of course hundreds of the entries I’ve written for the National Journal Writing Month challenges. The book publishing feature is great for travel books, journal entries related to projects and goals you’re working on, selected entries that you want to leave behind for your family to read. Read this article to learn about the book publishing feature. 2. Review and write about your goals for this year. 3. Try out some new journal writing techniques. During National Journal Writing Month, I use the Reminders feature to remind me to write and meet the daily month-long challenge. Though I have been journal writing for nearly three decades, I honestly still find it a challenge to keep up with daily journal writing because of the numerous other tasks I need to complete on a daily basis. I typically try to write my entries in the morning while my mind is still fresh, but if something comes up and I don’t get around to it, I have a Day One reminder that pops up in the menu bar and it allows me to write my journal entry without having to open the application itself. Note: there’s also advance features for Day One that enable you to write and email your entries and they will automatically get synced via your Day One account. Incidentally, the developers of Day One never have access to your journal entries. They’re all encrypted. Day One simply hosts your account on their server so your entries can be synced to all your devices. You can of course choose not to sync your devices and keep entries stored locally. You can also select to have your entries backed up locally on your computer hard drive. Thanks to the popularity and growth of Day One, both the Mac and iOS version of the application are now available for FREE! So there’s no barrier to getting started with Day One as long as you’re Mac or an iOS iPhone or iPad user. Both versions of the app contain extra premium features including unlimited journals, unlimited photo storage, cloud sync, customer support, and a 25% book printing discount. It’s easy to start and end your annual subscription using the iTunes account on your iPhone or Mac. The subscription is about how you will be for well grafted paper notebook. I encourage you to give Day One a try even if you use paper journals. 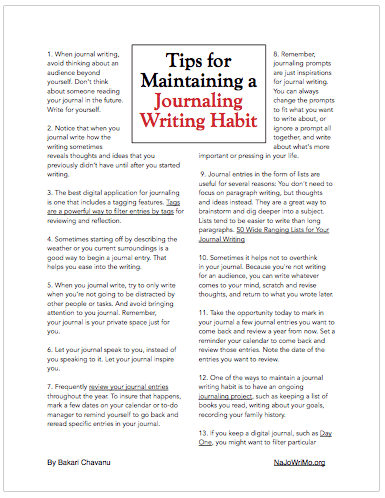 Day One or any digital journal for that matter makes your journals more accessible, and it may even help you write more. Let me know what you think of digital journals in the comment section below. I love Day One and have been using it for years. My only problem is how slow it is too launch. Maybe I have too many entries. I started using Drafts to start my daily journal entry and then import to Day One at the end of the day. Hey Sharon, thanks for your feedback. Yeah it’s possible that it launches slowly because of the number of entries you have. It should launch faster on an iOS device than the Mac version. Btw has you updated the latest Mac version? It got a lot of re-design updates, and they added On This Day feature to it. And yes, Drafts is another handy and great writing tool to use. I’m going to download the Mac version of Drafts today.